I have been evaluating Trigger Point Technology’s “Advanced TRAMS” for about a year now and I thought I would update you on what we think. First off, you need to install this on your AR. Seriously! If you run an AR for personal protection, property defense, Law Enforcement or combat hostilities, this is a force multiplier. No BS, It is. This is a “Fully Integrated Fire Control System” according to Adam Parsley, Manager of the Small Arms Weapon Systems Division at NavSea Warfare Centers, Crane, Indiana at this month’s SOF Show in Florida last week. I’d have to agree. If you are special forces, military, LE, or an individual, (and the prepping community comes to mind,) this will allow you greater flexibility, increased combat efficiency, greater piece of mind, and most importantly, a half second advantage in your gunfight. Even better, for you trigger snobs (Yes, I enjoy and admire a great trigger as well as the next gunman, as my friends say, “I resemble that definition”), Trigger Point now have Geissele triggers integrated as an option! 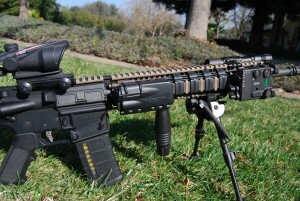 When you have limited manpower, a small team or just yourself on the overwatch, having a fully integrated fire control system on your trigger allows you unparrelled flexibility for selection of white light, visible pointer, infrared pointer or infrared illumination or whatever you have installed on your rifle Platform. Awkward position, no problem; only one hand available, no problem; less than a one ounce touch, and you have your choice, continue thru with a light trigger pull and you have rounds downrange, on target! Trigger Point currently as of today has their Advanced TRAMS installed on Special Forces M4 type rifles in combat in Yemen. Battle Testing in the sand makes our evaluation seem insignificant, but to update what we have done: Dragging thru mountainous brushy terrain by the rifle sling while crawling on our stomachs, using our foot to stomp the rifle and the TRAMS into the mud, shooting the same rifle in pounding rain (3” per hour storm) with 25 mph winds, swim tested, and general use and abuse as a school gun with many students trying the platform and technology out. We are pleased. The rifle and Advanced TRAMS, with the Steiner Mk 5 Battle Light, and dBal A3 worked better than expected and I found no flaws, no loss of function, and no loss of zero! Very happy! You need to evaluate where you are in your preparations and what your needs are in combat. There is no cost considerations when I balance the scales with my life or a loved one’s life. I do not install anything on my weapons unless it gives me an advantage. Period. No Rooney Guns allowed. If it doesn’t give me a tactical advantage it isn’t on one of my weapons. I have several TRAMS. ‘Nuff said. Go to www.Hammerstryke.com for more info or to Terry’s site, www.triggerpointtechnology.com. Of course you can contact us for more info at 209-614-1718 or if you would like to arrange a demonstration. Well said! Craig’s book Extreme Wilderness Survival should be in your collection. Too often we have students, typically the man, who attends class to get skills to carry the family in a survival situation, man made or natural. And we say time an again, “What happens if you are the casualty? Can your family take care of business and all survive?” We recognize the importance or building a team, commonly referred to as tribe, kith, kin; and we offer family discounts and even encourage youth to attend at half price or even free so that they gain skills as well. Please, get the whole family involved in your prep plans! And since we are talking about books, other good books to have in your library (ALWAYS in print form – your e-book will be worthless in a grid down situation). And getting trained in Emergency Medicine goes without saying, Basic First Aid at a minimum, and as much higher qualifications as you can manage. Getting the certificate is nice but getting the skills is the most important. Take a class or get with a buddy who has the skills and have them pass it onto you and yours. Needle decompression, wound packing, suturing, etc…. are all good skill sets. And don’t forget your family, have them join you and make it a family class! Today’s defensive rifle is not your Grandfathers gun anymore. With the increasingly dangerous and unpredictable times we live in now, Grandfather would be lining up just like we are to acquire an AR platform or other rifle. And then there is the myriad of accessory modules we have available. Current technologies and accessories are probably at their highest pinnacle so far, with white lights to IR Illuminators, to various lasers, etc. More and more people are realizing that Weapon Mounted accessories are not just a force multiplier, they are a necessity. What we don’t have is a clean way to deal with these various modules and their cables or switches.. Enter Trigger Point Technology’s “Tactical Rail Accessory Management System” or TRAMS. This is probably the more expensive of the various solutions out there for dealing with the tape switch’s, buttons, electrical tape, zip ties and Velcro – but Boy, is it the cleanest, neatest, rugged, and most configurable! The proprietary “Shepard Clips” and “Rail Crossing clips” are the neatest item in cable management. Gone are the duct tape, electrical tape, zip ties and Velcro of yesterday. These clips are tough! And they are the best cable management in hazardous situations or where things such as trees and brush can grab your cabling. The cabling provided with the TRAMS kit from the mag well button to the TRAMS is stainless steel with a stainless steel mesh jacket. Man, you have to really want to cut this cable to do so. A free included cable plug mod is available should you not have the right plug end on your accessory. Additional plug mods are really reasonable. Custom installation by our gunsmiths has all the plugs, caps, etc. safety wired for even more security from Murphy. The TRAMS Advance is a Military and Law Enforcement restricted sales item which incorporates a trigger switch activation capability. I know, I know, I’ve heard it all. Activating your accessories by your trigger finger on the trigger??!!? Well, I say, “Come on, Think about it”. Just like we do not search with our muzzle or search with our white weapon light (Bullet magnet anyone? ), – you do not use your trigger to turn on and off your accessories. You use the mag well button. However when you do have a threat in front of your sights and your finger does go to the trigger to send rounds down range, you will immediately have light and laser confirmation of where you are shooting just by touching the trigger. This is also a last ditch warning that you are about to place rounds in motion. The trigger switch activation takes approx. 1 ounce of pressure, well below your rifles trigger pull to fire a shot. This trigger is slotted and designed to allow debris such as sand, to readily fall away and not interfere with operation in any manner. I will say that the Shooting Sports industry has done a superb job at getting the word out regarding the three fundamental gun safety rules. The feedback on the trigger switch is overwhelmingly negative, esp. with the bean counters, legal types and others. Operators and gun slingers who actually do the work and go into harm’s way, immediately see the benefit. Actually we don’t even have to explain the product, just place it in their hands and they ask how much and when. When our testing showed a .3 second advantage in a lethal hostile encounter, that’s huge. Then the FBI’s unofficial testing showed a .4 to .6 second advantage! Wow, A half second advantage in a gun fight? That’s a no brainer with gun slingers worldwide. Not so much with legal types and bean counters worried about liability. But when was the last time they had to make entry? There is a Glock version of the TRAMS concept coming this summer. A new visible green laser, purposely designed form factor to fit the form, dimensions, rail, etc. of the Glock, it actually looks like part of the firearm, will be coming out. The laser has the typical button activation on the side of the laser for the trigger finger or support hand activation. This product places a small magnet (size of a sesame seed) on the Glock trigger safety lever which works as the laser activation switch. Again with the sobbing and hand wringing of having a trigger activated accessory. Get real! You would activate the laser with the laser button, not the trigger, if you want it steady on. The trigger switch is a last ditch activation when you are going to trigger in a hostile encounter. This causes the laser to pulsate 8 times a second on your target and is your final warning you are about to send rounds down range; or correct your aim cause you are a little off. The trigger lever activation is approx. 1 oz. Well below what it takes to break the typical Glock 5.5 pound trigger. Even if the laser is off, the trigger turns it on flashing green. AGAIN, You do not search with your muzzle, weapon lights or lasers. That is what the hand held light we all carry is for. Get your head out of your weapon, get your head up and get into your gunfight! However if you do encounter a threat and your finger goes to the trigger, rest assured you do not have to worry about which tape switch to press, the accessory is already on. Civilian concealed handgun carriers may now find themselves in an Active Shooter Interdiction. The San Bernardino California Office Party and the Brussels Airport Bombing were yet another wake-up call for Sheepdogs around the world. The level of lethality now being used against innocent civilians requires the most advanced mindset, combat training and tactics ever devised. If you think your basic Concealed Carry class is going to cut it, allowing you to rise to the occasion, then you are delusional. How many of you would have noticed and alerted to, two men wearing a single glove on the same hand pushing luggage carts together? How many of us would have understood why? How many of us would have addressed the situation by alerting authorities as they bailed on their travel plans and took their family out of the airport and harms way? Movie Theaters, Shopping Malls, Houses of Worship and others, are all places we go to relax, shop, or worship; with an expectation of being safe. Unfortunately in today’s world, this is a memory of the past. If you are not prepared to react violently, quickly, and effectively, then you and/or your loved ones are statistics. Can your family, or your close friends/coworkers, move and fight as a team? Do they practice together and communicate? Do you have a plan? Today’s world is dangerous. Preparing now, may save a life later. As John says “Make sense when you think about it”? Our problem is that we don’t want to think about it. Its scary. Much easier to keep the blinders on and hope for the best. Time and money can be spent on other things. My question – after a loved one dies or is crippled – what cost is that time, training and ammunition worth now? 17 percent were killed by responders. 6 percent occurred in a religious establishment. •	Think short duration, high intensity event. •	Think where you are strong and where the shooter is weak. •	Think of the places you frequent, which are likely venues for such an event. •	Are you prepared to respond in those places? Two percent of the shooters bring improvised explosive devices (IEDs) as an additional weapon. In 10 percent of the cases, the shooter stops and walks away. In 20 percent of the cases, the shooter goes mobile, moving to another location. 43 percent of the time, the crime is over before police arrive. In 57 percent of the shootings, an officer arrives while shooting is still underway. The attacks ended before the police arrived 49 percent of the time. In 56 percent of the attacks ongoing when police arrived, officers had to use force to stop the killing.